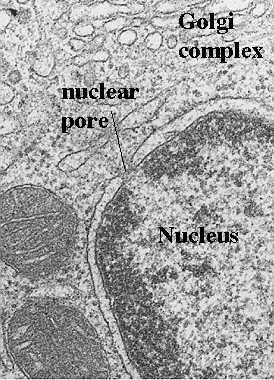 Nuclear pores are formed at sites where the inner and outer membranes of the nuclear envelope are joined. The figure to the left shows an electron micrograph of a nuclear pore. It appears as if the two membranes are pinched at that site, leaving a space filled with filamentous material. Sometimes a thin diaphragm may be seen running horizontally through the pore. Also, the chromatin which carries the genetic material is organized so that a space or "pathway" is created to the nuclear pore. A great deal of progress has been made in our understanding of how the pore is structured. However, we still do not know exactly how the components function. The following figure illustrates a model for the structure of the components of the nuclear pore complex. We will then show you how cytologists can visualize this structural organization in various preparations. 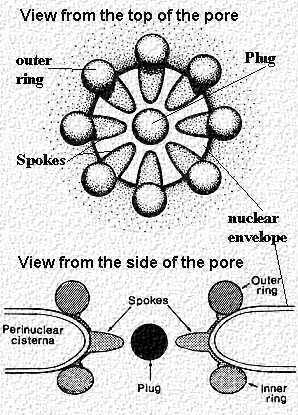 The above figure shows a view of the nuclear pore from the top. It contains 8 subunits that "clamp" over region of the inner and outer membrane where they join. Actually, they form a ring of subunits 15-20 nm in diameter. Each subunit projects a spoke-like unit into the center so that the pore looks like a wheel with 8 spokes from the top. Inside is a central "plug". The next (left) figure shows a cross section of the pore with the clamp-like complex adjacent to the membranes. The projected spoke is directed towards the central "plug' or granule. Figure modified from Bloom and Fawcett, A Textbook of Histology, Chapter 1, Figure 1-11, Chapman and Hall Publishers. This electron micrograph shown in the figure to the right depicts a nuclear pore complex seen with the transmission electron microscope. As is obvious, little detail can be seen. The inner and outer membranes of the nuclear envelope are joined and there appears to be a diaphragm-like structure in the center. However, the intricate detail pictured in the foregoing figure cannot be appreciated. One needs to use different preparative techniques to see the subunits and their organization. These will be discussed and illustrated in the following sections. How can you visualize the nuclear pore complex? How does the nuclear pore complex work to transport material in and out of the nucleus?